Kherson State University Herald. Series: “Geographical Sciences” is a scientific and theoretical journal of geographical focus area founded in 2014. The founder is Kherson State University. Periodicity: up to six times a year. According to the Editorial Board policy, the goal and targets of the journal are to publish the results of researches, to familiarize an academic community with the latest achievements in the area of geographical science and education. The journal is aimed at disseminating knowledge in geography, sharing ideas and research findings among Ukrainian and foreign scientists. It publishes the results of researches in the sphere of geographical science and education achieved around the world prioritizing the study of Ukrainian territory and its educational and scientific space. 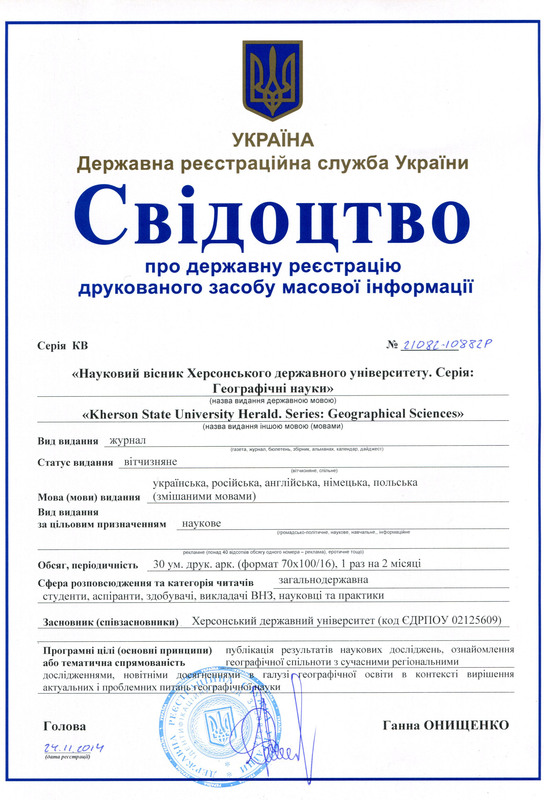 Certificate of state registration of the print media: КВ № 21082-10882Р dated November 24, 2014 (registered by the State Registration Service of Ukraine). Kherson State University Herald. Series: “Geographical Sciences” is a professional edition according to the Order of the Ministry of Education and Science of Ukraine No 1222 dated 07.10.2016 (annex No 8). The journal covers topical issues of socio-geographical research; nature-geographical and geo-ecological research; geography of recreation and tourism, etc. The journal also informs about the events of scientific life and geographic education in Ukraine; submits reviews of scientific works and textbooks on geographic topics. The editorial board carries out external and internal reviews of all articles. The editorial board of the collection includes leading Ukrainian and foreign scholars. The journal cooperates with the best Ukrainian and foreign HEI, public and local authorities. Such cooperation involves publication of information materials and scientific articles, performance of round tables at the premises of the journal office. The collection contains scientific-theoretical and practical materials on topical general-theoretical and branch geographical issues. A target audience is students, external doctoral candidates, lecturers of higher education institutions, scientists and practitioners, as well as all who are interested in topical fundamental and applied advances of geographical science. The journal practices a policy of immediate open access to the released data supporting the principle of free distribution of scientific information and global knowledge exchange to the benefit of general public progress.